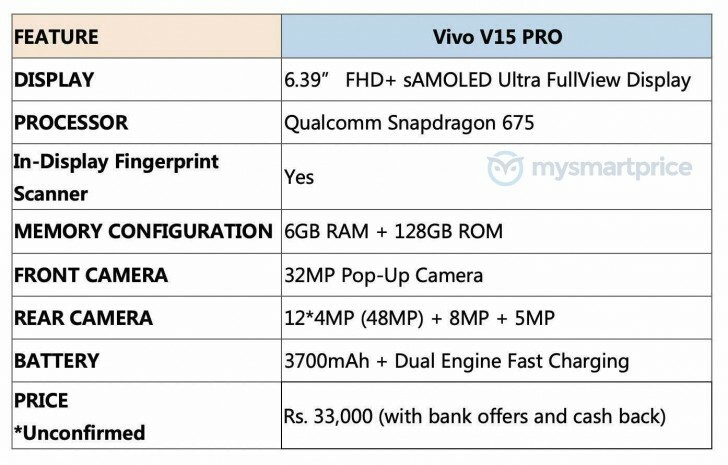 Vivo obviously isn't a huge fan of rumors, so they have decided to put an end to them regarding the V15 and V15 Pro's front facing camera. They have releaved that the new phones will have a pop-up selfie camera, and they have posted official images on their Twitter and Facebook to prove this. The camera inside the pop-up mechanism will have a 32MP resolution, however other specs are still unknown to us. We will know more details on February 20 when Vivo officially releases the information. The Vivo V15 and V15 Pro will also have a triple camera setup on the back. The LED flash will be placed between two sensors. On the other hand, there's been a leaked spec sheet as well that claims to reveal everything about the Pro version's internals. The phone will be powered by a Snapdragon 675 chipset paired with 6GB of RAM and 128GB of internal storage memory. On the back, the main shooter will have 48MP resolution, aided by an 8MP telephoto lens and a 5MP depth of field sensor. The images don't reveal any sort of a fingerprint scanner, which means that it will probably be placed beneath the AMOLED display. All this will be fed with power with a 3700 mAh battery.